None in the top hits were even cube related, even those with ‘cube’ in the title did not actually refer to anything remotely cuboid in shape, nor characteristics. The irony of these search results tempers my frustration with at least a little humour. The rest of the results were no better. I thought that Google images would give me a broader view that might help me spot something interesting. No maths related cubes here – there are cubes that look fun, but just cubes, and there are maths toys that look at least interesting, but not really what I was looking for. Yet I know there are businesses that seek out and carefully choose toys that are genuinely interesting and innovative. I’ve seen them in the past, I’m certain that there are lots more – why are my search results dominated by Amazon and eBay sellers peddling pretty much exactly the same stuff? 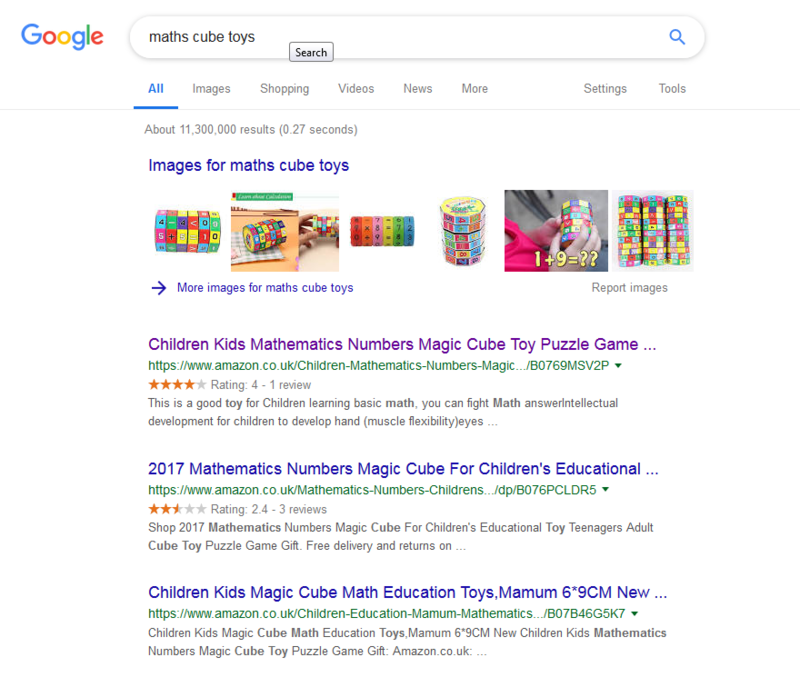 To be fair, I managed to find one site among the results that’s worth a browse, and the second time I did an image search, the results also included a power-of-two cube that looked interesting. But wow – talk about drowned out by the noise! This isn’t a ‘things were better in the good old days’ sort of a rant. It’s a clear statement – discovery of sites on the World Wide Web used to be a lot better than it appears to be today.